"Cat's Eye is the story of Elaine Risley, a controversial painter who returns to Toronto, the city of her youth, for a retrospective of her art. Engulfed by vivid images of the past, she reminisces about a trio of girls who initiated her into the fierce politics of childhood and its secret world of friendship, longing, and betrayal. Elaine must come to terms with her own identity as a daughter, a lover, an artist, and a woman—but above all she must seek release from her haunting memories. Disturbing, hilarious, and compassionate, Cat's Eye is a breathtaking novel of a woman grappling with the tangled knot of her life." In Cat's Eye, Margaret Atwood defers to the traditional idea of girls being bitchy and manipulative, especially in numbers. Cat's Eye, however, is not traditional in the least. Elaine enjoys, in tandem with her brother, a non-traditional, relaxed, tomboyish childhood, which is brutally cut short by the female mind as Elaine finds out more and more what other girls expect from her. Any female who has been victimised by other girls in the past will be cut to the quick by Atwood's realistic delineation of the relationship between the girls in this murky and controlling sorority of four, in which loyalties change daily (if not even more often). Atwood ups the ante with the shock factor, though: while many of us associate these cruel behaviours with teenage girls, the characters at the time of these occurrences are barely more than ten years of age, which I found tempered the realism slightly. However, this is more than compensated for by Atwood's lyricism and her ability to make us wince in equal measure elsewhere in the novel. This, all in all, makes for a gripping read, and it provides a welcome departure from Atwood's frequent dystopias (even though she comes back to it later on in her writing life), although the scenarios set up in Cat's Eye are perhaps added to by the idea that they are real dystopias, not hypothetical ones. It does tail off towards the end, and admittedly I couldn't always see the importance of Cordelia specifically (her manipulation of Elaine seemed much more of a team effort with the other girls than a sole project), but I certainly liked the idea of the cat's eye acting as a central symbol throughout. The use of a physical object for this (i.e. the cat's-eye marble) is also a very human idea: how many of us have been catapulted back through time, jolted there by the sight of a single innocuous object? Its universality is appealing, and yet Atwood has chosen something unusual enough to be interesting. 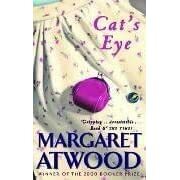 Cat's Eye, while not perfect, therefore at least serves to show that Atwood is not a one-trick pony. Providing gripping, sophisticated and yet readable novels, her oeuvre is certainly worth the addition to any bookshelf.